My folks got me a book for my Birthday: The Pizza Bible, by Tony Gemignani. Particular is an adjective that does not do this book justice. The book is exhaustive in its detail and calls upon you, the reader and self-proclaimed Pizza aficionado, to practice painstaking attention to detail. Okay, sure that’s good practice. Uh, okay. Seems overcautious, but fine. The dough must be made two days in advance. Whew, I guess I can manage that. But really, it should be made four days in advance with a Poolish starter. Anything less and you’re a disappointment to your Italian heritage. There are TONS of recipes, and they are written with a fastidiousness that I have come to greatly respect. Jen and I have been making a pizza about every other week since June. This doesn’t seem like much, but each recipe feels like a spiritual pilgrimage. Over Labor day weekend we explored one particular recipe which was dressed to impress: a Fully Stuffed Chicago style behemoth. Enjoy this pictorial exploration into the pizza’s creation. In order of appearance it’s: Lower crust, Mozzarella, Meatballs, Pepperoni, Hot & Sweet Sausage, Onions & Mushrooms, Red Peppers, Pecorino Romano, Shredded Mozzarella, Provolone, Top crust. You can practically taste it through the screen. Top it with some tomato sauce, ricotta, and garlic oil? Scrumptious. Generally speaking, yes. I can believe it’s not butter. The internet is bursting with cooking substitutions – many of which are targeted at people seeking healthier eating. Ever since my high cholesterol diagnosis I’ve been painfully aware of my diet. Begrudgingly, I’ve started considering these alternate eating options. When I give one of these substitutions a shot, I admit that suspicion eclipses my excitement. I know it won’t be as good. I know it. And so it is with vocal astonishment that I announce that Plain Greek yogurt is LEGIT a good substitution for Sour Cream. I used it in a soft taco. A TACO! I can imagine it working in a chili where it doesn’t play as important a role… but a taco? This is the real deal! I admit this is not a perfect substitute, but it’s super close. It lacks just the slightest of tang. But otherwise it’s great! It works and it works well! I think it’s safe to say that most people do not have as strong a relationship to their grocery store as they do to, say, their clothing establishment (CTshirts.com all the way! ), bank (Dwolla thank you very much), or hardware store (Lowes or bust!). In fact across the history of Mike D, I’ve mostly gone to the closest cheapest place. In college that was Price Chopper. In Meriden, Shop Rite – until Big Y bought the location. Then it was Big Y. Once we moved to Clinton, there were a collection of grocery stores all within the same driving radius. We ended up picking Stop & Shop. Stop & Shop isn’t known for their amazing prices, but Jen and I found an environment that was friendly to couponers – and we went all in. And then came the gas points. We started tentatively with Stop & Shop’s gas points, like a first date where you don’t know how things are going to pan out. We were flirting and it seemed like it had massive potential. 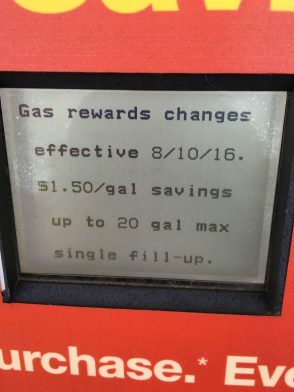 It works like this: when you buy certain items you get a bonus amount off per gallon. For example, buy 6 cans of Progresso soup get $0.40/per gallon! You could stack these deals to get up to $2.20 off per gallon for up to 35 gallons. $2.20 off 35 gallons? Take a good look at those limitations. By purchasing gas tanks for extra storage I could hit the limit of 35 gallons every time. At $2.20 off per gallon that equates to a savings of $77. Add in a coupon or two and we’re talking Black Swan savings. The gas points got us and got us good. 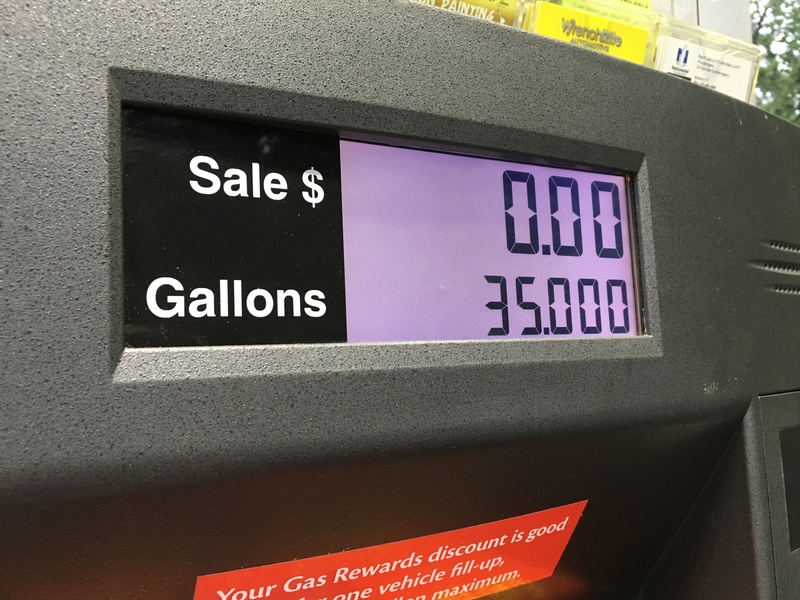 We were calculating fill ups and buying exactly what we needed to fill our tanks, it felt invigorating and intoxicating, like gambling and winning… more than just winning… we couldn’t lose. As the price of gas dipped below $2.20, the emotional impact reached Miss America crowning levels of elation. 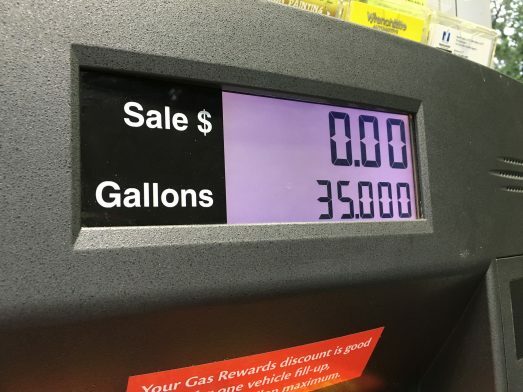 35 Gallons for $0.00? Color me addicted. And there we stayed, glued to the chair of our proverbial slot machine – pumping in our nickels and pumping out dozens upon dozens of cans of beans, boxes of eggo waffles, packages of Mama T’s Perogies, Prego ready meals, tomato sauces, barbecue sauces, bags of chips, maple syrups, hundreds of cat food cans, countless pounds of cat litter, dozens of pounds of sugar, and thousands (literally) of gallons of gasoline. For two years we have been living this dream. And then Stop & Shop caught on. 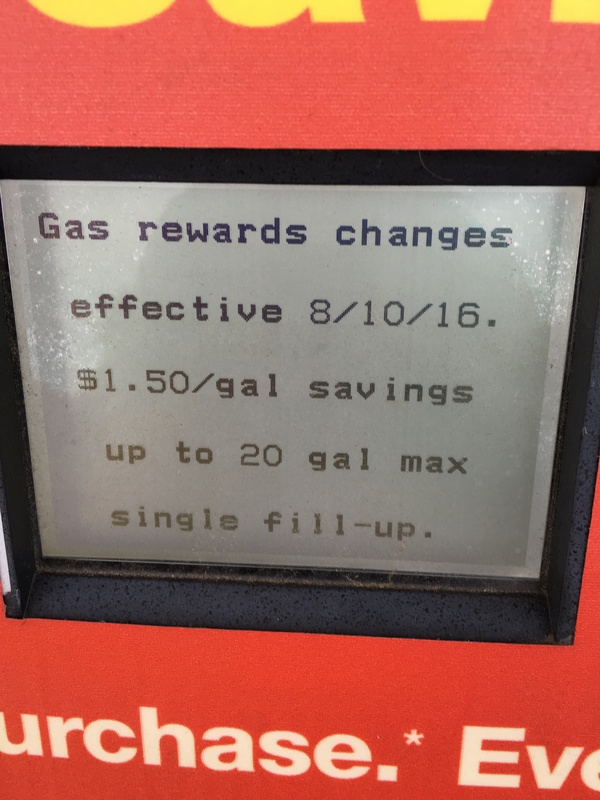 The announcement that on August 10th they would be changing the limits to $1.50 off per gallon with a 20 gallon limit… it slapped me in the face – hard. My spirits plummeted. I can’t blame them. I think it’s a smart business move. Surely we aren’t the only ones taking advantage of the system. I can’t be sad to see it go, I’m by no means entitled to such savings – but I am thrilled to have been part of this program. It has been a shopping experience like few others. Unlike most people, I think it’s safe to say I have developed a strong bond with my grocery store. I can’t say that I won’t explore other chains in the future, but I’m deeply grateful for our Stop & Shop gas points experience. Thank you Stop & Shop for one heck of a ride. There was a beautiful lunar eclipse on Monday night and to celebrate Jen and I invented a delicious treat: The MoonShake. 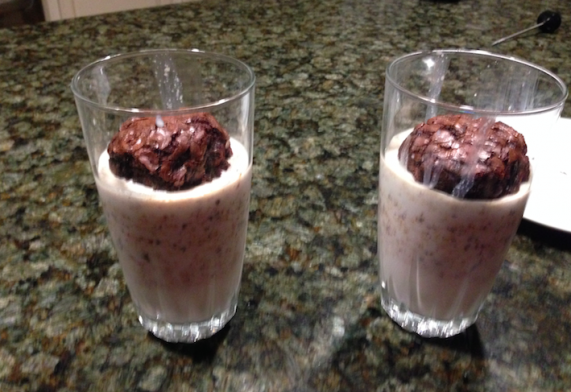 It’s a milk shake topped with a round brownie. 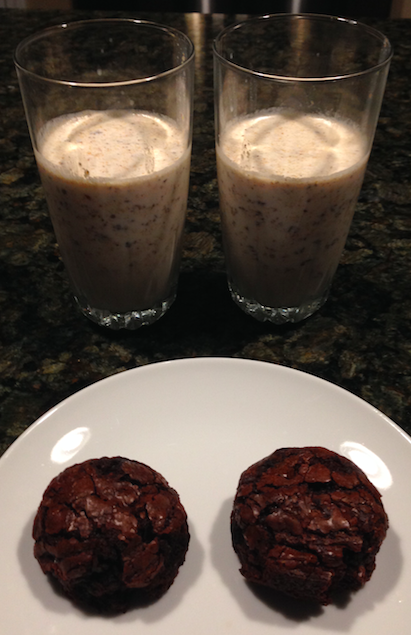 This one was a peanut butter milkshake, but it doesn’t have to be. Any vanilla based ice cream shake would do the trick. We now have a new tradition. Lunar eclipses will never be dull again. This cheese came recommended by Michelle & Noah, two masterful foodies whose opinions carry more weight than most. Jen and I had been looking for a proper cheese for tomato caprese salad. During our trip through Italy we had the most amazing Caprese salads! 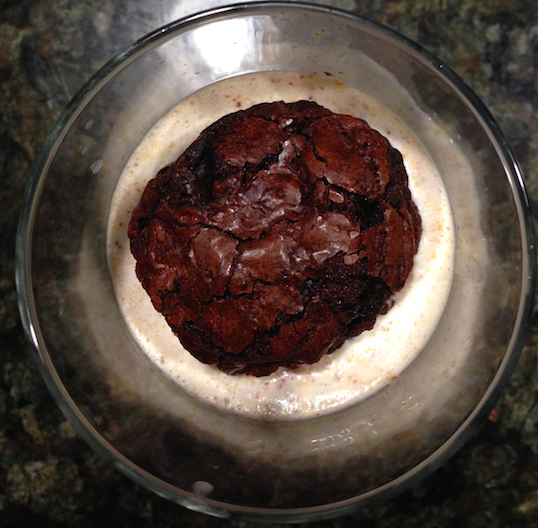 But here at home, our attempts did little more than disappoint. Even the revered buffalo mozzarella felt like a cheap substitute. The word “Burrata” means “Buttered” in Italian and, curiously, wikipedia reports that this cheese was originally a way to use up scraps of unused mozzaralla. Don’t be fooled, this is no left-over cheese. Burrata is a treasure chest of a cheese. 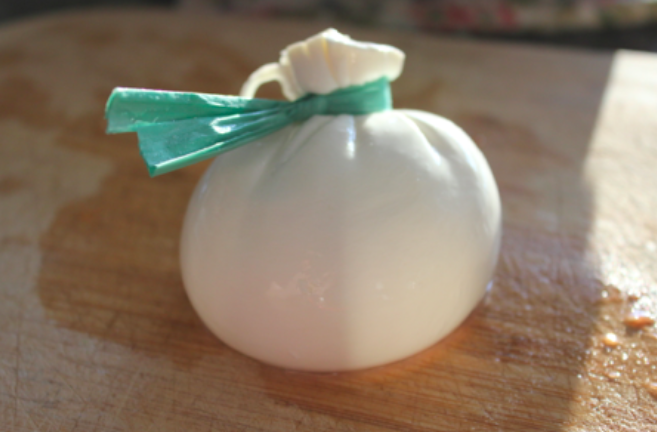 It consists of a protective outside shell of mozzarella encasing a precious richness of cream inside. Like its mozzarella brethren, Burrata is sold in a salty brine. But unlike its inferior relatives, Burrata’s cream interior elevates the soft creamy texture to new levels. 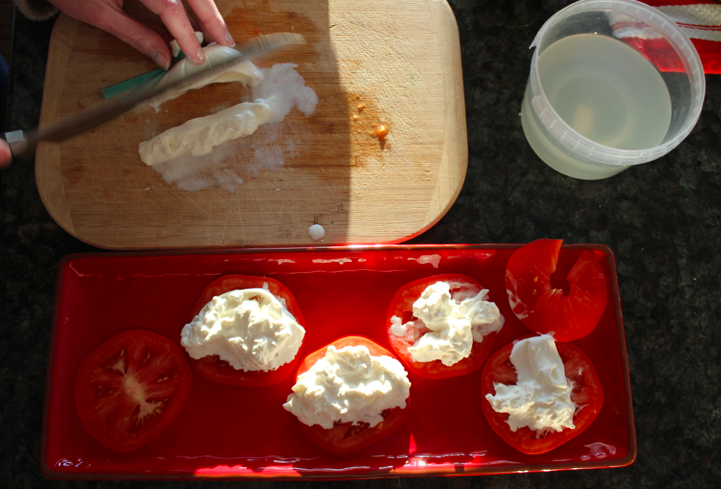 When you cut open the ball of Burrata, the thickened cream flows out. Quickly throwing on a caprese salad and topping with balsamic and basil? It’s perfect. The faults of this cheese are very specific. The taste is off the charts, but use is limited and cost is high. Websites recommend it for salads and… well, that’s about it. It’s beyond perfect for Caprese but impossible with a cracker. The other downfall? Price = $5 per ball. This is an expensive luxury. 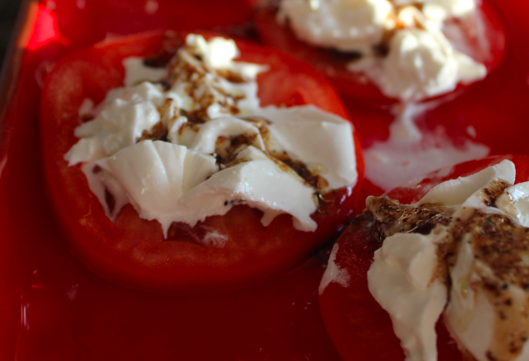 *Fun fact: we made this amazingly perfect caprese salad with the WORST TOMATOES EVER GROWN. I am eager to see how memorable the salad is with fresh tomatoes and basil from the garden. I expect nothing less than nirvana. There are certain foodstuffs that require a very high time investment to make. In general, dinners that require me to schedule time on my calendar are less likely to happen. For example? Raviolis. The solution: Economies of scale. If you make a HUGE HEAP of raviolis all at once it is entirely worth it. Jen and I have developed a good system: I make and roll the dough, Jen stuffs and seals the raviolis. We then lay the raviolis out in sheets and freeze for later. It’s perfect! Except that freezer space becomes challenging when you have 200+ raviolis that need freezing because you can’t stack unfrozen raviolis; they stick together. A few weekends ago I built a ravioli apartment complex for the freezer. It accommodates up to 6 stories of raviolis, each of which holds approximately 62 raviolis. Economies of scale has never been so delicious. Traditionally Italian, Fontina is an earthy flavored cow’s milk cheese that originates in the alps. Officially, Fontina can only be Fontina if it’s made in the Aosta Valley. The Aosta valley is in the north-westernmost corner of Italy north of Turin and abutted to Switzerland and France. 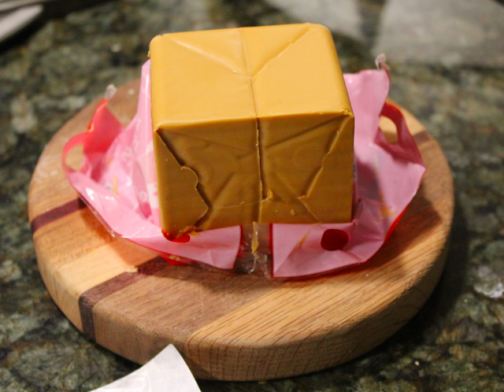 The cheese’s texture is a bit more spongy than some of our more recent trials (my amateur tooth would put it in the same texture universe as an un-aged gouda). The mildly pungent woody taste is enjoyable but for me not overly rewarding. Note to the pregnant: This cheese is unpasteurized. Note to Kurt: Don’t overanalyze that last sentence. 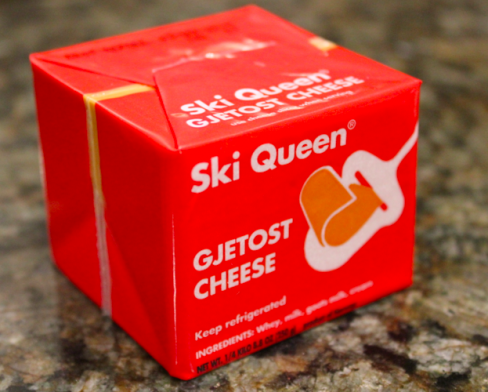 GJetost (pronounced: YEH-Toast) is a Norwegian cheese that we purchased from our local favorite cheese show Fromage. It’s a mix of goat’s, cow’s milk, cream, and whey and it looks like a toy. Caramel in color and with a firmness close to cheddar, GJetost has been described across the interwebs as fudgey. The packaging recommends serving in wafer thin slices alone, with fruit, bread, or… butter. Yes, butter. Taking it out, it’s carameliness is even more pronounced. It holds the shape of its package just like a caramel. We cut off a thin slice and gave it a shot. Describing it as fudge-like is extremely appropriate. It is sweet and dessertesque. We tried it on thin toast: totally amazing! What a fun unique cheese! Independence: Extremely high. This one would be good for breakfast, lunch, dinner, or dessert. Try this one for the unique experience.